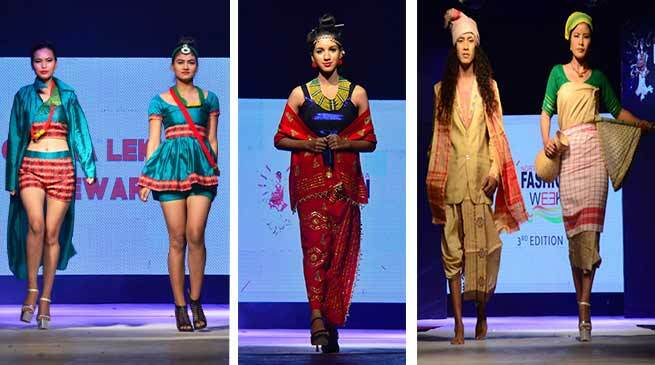 The third edition of the North East India Fashion Week– The Khadi Movement at Itanagar’s Nyokum Lapang Field concluded on Sunday with international designer Joseph Aloysius Montelibano from Philippines showcasing his collection along with 15 weavers and designers from the Northeast India. Weavers and designers from Assam, Arunachal Pradesh, Nagaland, Manipur, and Mizoram participated on the Day 3 of the event. The three-day fashion extravaganza has been organized in association with Arunachal Government and Arunachal Tourism. Yana Ngoba’s flagship event, NEIFW has been conceptualized to inspire and encourage the upcoming handicraft the region’s artisans and designers who work exclusively to promote northeastern fabrics and culture. “Today handloom is the latest fashion, and wearing handloom, the most popular trend. Northeast has never had dearth of handlooms, and after years of weaving magic in their looms, the weavers, and their artifacts are gradually becoming crucial elements in fashion,” said Fashion Designer and Founder of Yana in Style, Yana Ngoba. “Through North East India Fashion Week, we aim to bring recognition to the ‘magicians’ behind the loom. We, along with our partner NGOs, aim to train and market the weavers and designers from the region, and through sustained skill development, capacity building, cluster development initiatives help build a brand of their own”, she added. in this Festival NEIFW presented a wholesome combination of designers, as well as promising weavers from across the northeastern region. International fashion designer Joseph Aloysius Montelibano from Manila, Philippines presented the finale collection. The show left the audience enthralled as the models sashayed the ramp adorning brilliantly coloured and uniquely designed collections made out of indigenous fabrics. The line–up of the weavers who presented their collections today were, Krishna Sonowal from Assam; Apatani weaver Hibu Ollo and Khampti Weaver, Nang Tripura Langkhun from Arunachal Pradesh; Mizo Weaver Lalsangzuala; Aao Weaver, Yatetla Pogen from Nagaland. Besides, there were young as well as established designers from different states of the region and India, who showcased their designs and collections crafted out of the regional looms and fabrics. Noteworthy among them were Elangbam Bijen Singh from Manipur; Dosoulou J Vemai from Nagaland; Sunita Boro from, Assam; Arang Biri, Minu Mara, Rattan Utte and jewellery designer, Nyoi Nyodu Padu from Arunachal Pradesh and International Celebrity guest fashion designer, Montelibano from Philippines. Yana believes that it is very important to preserve the northeast region’s rich fabrics, traditional handlooms and handicrafts, and very few of the designers from the region are making an effort to do so. Their mission is to promote and preserve the vast variety of indigenous textiles and crafts that are slowly losing popularity amongst the younger generation, through fashion shows and help create business and branding opportunities for industries directly or indirectly engaged in retailing handloom, textile fashion and life.